Roy Dennis is a professional ornithologist and wildlife consultant working for the Highland Foundation for Wildlife. He is one of the world's leading experts on Ospreys and other raptors. 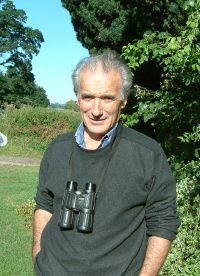 Roy has beeen working with Ospreys in Scotland since the 1960s and, with Reserve Manager Tim Appleton, was the driving force behind the translocation of birds to Rutland. During the Translocation phase of the project he was primarily involved with collecting young from Scottish nests and advising the Rutland members of the team on all aspects of Osprey behaviour and ecology. He has always been very closely involved with the project and we have been continually grateful for the way he has shared his enormous expertise and knowledge. 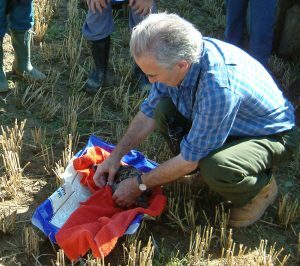 On 25-26 July 2003 Roy visited the project team at Rutland Water, a visit that coincided with the ringing of two of the chicks at the second of the year's successful nests. This has been a fantastically successful season. I feel this is a breakthrough year with five young birds soon leaving for Africa. Hopefully they will return to breed with the translocated birds in this area. During this visit it has struck me again how much room there is for more pairs in the area. Hopefully these birds will act as a nucleus for a growing population of Ospreys in the centre of England. This is the first known breeding of a two-year-old female in the UK. Often in Scotland they will not start breeding until they are 4 to 6 years old. It may be to do with the lack of adult competition for nest sites here in Rutland. Another crucial factor may be the broader range of fish species available here.